Hungary: Nagycenk Municipality Website (June 2018). Election of Zsuzsanna Lukács & new Presidium. In Hungarian. Ireland: Tipperary Star Newspaper (21/6/18). Election of Niall Gregory to Presidium. In English. Netherlands: Stichting Friends of Europe Website (June 2018). Election of Boy Scholtze as President of the Charter. In Dutch. Ireland: Tipperary Star Newspaper (26 July 2018). Cashel Delegation to Annual Meeting in Nadur, Malta. July 2018. In English. Denmark: Sjællandske Newspaper (28 July 2018). Næstved Delegation to Annual Meeting in Nadur, Malta. July 2018. In Danish. Sent by Lars Westermann. Malta: Times of Malta Newspaper (29 July 2018). Annual Meeting in Nadur, Malta. July 2018. In English. Link by Daniel Meilak. Croatia: Opcina Tisno (September 2018). 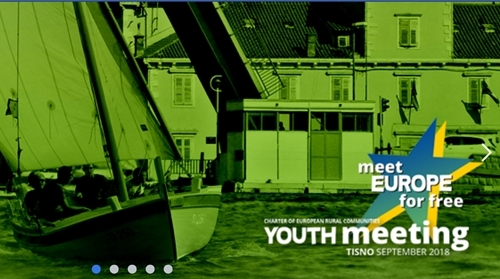 Youth Meeting in Tisno, Croatia. August 2018. In Croatian. Link by Miljenko Meštrov.